So, how do you ensure that your home and your family are ready for whatever the remaining winter months have in store? By being prepared for all types of weather and making sure your family members all know what to do in the case of an emergency. Here are five winter preparedness tips to keep you safe, regardless of the weather. Watch out for the ice. Ice is a traditional winter foe, and it’s hard to prepare for. The presence of a layer of ice outside alerts us that it could be cold enough inside to freeze pipes under cabinets, in basements and in rooms along exterior walls. Don’t be lulled into a false sense of security by an unseasonably warm start to winter and allow your usual cold weather preparations to lapse. Cover older windows with plastic, wrap pipes with insulation and remember to open cabinet doors to allow the free flow of air when the temperature dips below the freezing mark to avoid burst pipes that can cause a flooded basement and water damage. Let it snow, but prevent the dams. 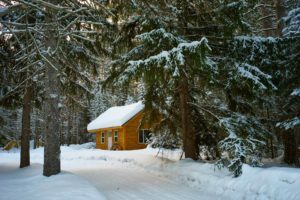 Whether you love it or hate it, snow is unavoidable in the winter months. A dusting is pretty, and snow days are a great excuse to go outside and play. However, a quick thaw after a snowfall followed by a drop in temperature can cause ice dams on your roof, and they’re not something to ignore. They can wreak havoc on your shingles and gutters and cause water damage in your attic. Once water gets into your attic, it could potentially leak down into the rest of your house as well, causing mold to form inside walls that will require mold remediation. Fortunately, proper insulation and ventilation can reduce or eliminate ice dams. Plug the air leaks that result from gaps in the ceiling–look for gaps in the drywall around light fixtures, outlets and plumbing pipes. Make sure you have more than eight inches of insulation in your attic (building codes require about 12 to 14 inches of fiberglass or cellulose). And make sure you have roof and soffit vents that will keep your roof cold by ushering in cool air to replace warm air from the attic. A cold roof is the secret to preventing ice dams. When the wind blows, don’t let the bough break. Old Man Winter’s wind can pack a powerful punch, whether it’s accompanied by precipitation or not. Avoid winter damage by having the trees on your property trimmed regularly to ensure that compromised limbs don’t break off in high winds and end up crashing through windows or causing storm damage to your roof that might require the services of a board-up service or restoration company. Fan the flames after maintenance. When a sudden chill sets in, there’s nothing quite like snuggling up next to a cozy fire in the fireplace. However, regular fireplace maintenance is crucial to ensure your fireplace is working properly and burning safely to avoid the need for a fire damage or smoke removal service. Wood burning and gas fireplaces require different service and cleaning. Read your owner’s manual or check online for fireplace safety tips. Be prepared for “Spring” showers in the winter. Sometimes the showers that might bring May flowers come early. After a heavy winter rain, it’s important to check for a flooded basement or water damage in other places around your home that might require water removal or water mitigation. Take a peek outside to make sure you don’t have water accumulating around your landscaping. Keeping your gutters clean will help avoid roof damage caused by water build-up as well. January doesn’t always mean snowmen and mittens, and sometimes winter weather can catch us off guard. Whether this winter calls for flip flops or fleeces, being prepared for all types of unexpected winter weather will help you keep your home and family safe, warm and dry until spring comes along. If you find yourself in need of board-up or a restoration service due to an unexpected event like a flooded basement, roof damage, or fire and smoke damage, the compassionate, experienced and trusted restoration experts at Hays + Sons are just a phone call away, 24 hours a day, 7 days a week, 365 days a year. With offices throughout the Midwest in Fort Wayne, Crown Point, Indianapolis, Columbus, Muncie and Lafayette as well as Cincinnati, Ohio, there’s a Hays + Sons near you.